This farm, just south of Longtown, appears to have been connected with my Graham family for many years. See Geograph for some pictures, and click on the above G or L links for a map - you can zoom in to see the farm itself if you switch to aerial or satellite view. The earliest I've traced to date was Andrew, who died 1739, then his son Stephen who died 20 years later. Then his eldest son Andrew, who seems to have moved to Craigs in Bewcastle, leaving his brothers Grimston and David at Fauld, Grimston dying in 1810 and David in 1812. The earliest Graham reference to Fauld I have found is not necessarily one of mine, although it would be good to prove a connection: that of George Graham, supposedly a son of "Lang Will", the one who felt it expedient to leave Scotland. Read this for an interesting write-up on assorted Grahams (with bibliography). 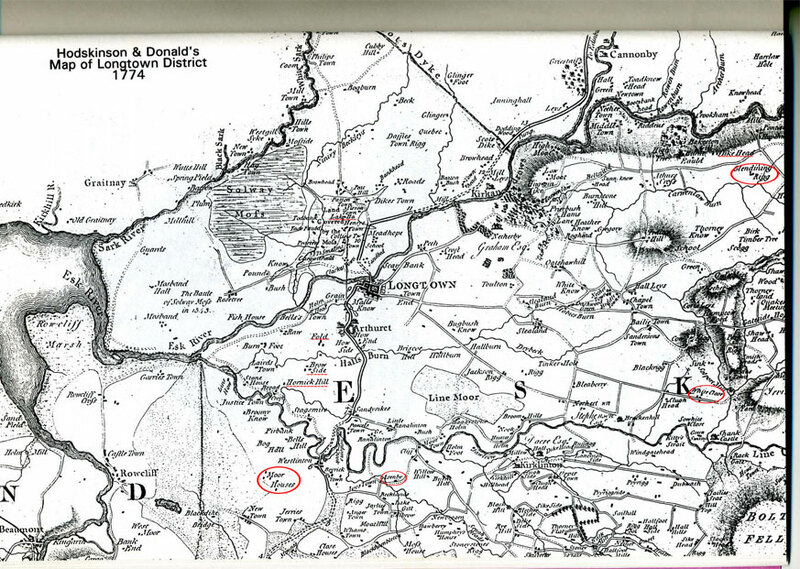 However, Fauld wasn't held by a continuous line of Graham families from the above George till Grimston and David, several other family names being associated with it, including a Stephen Grimston who died there in 1671. Given Stephen Graham's son's name - I'd like to connect him in somehow, both Stephen and Grimston being rather uncommon names in the area. I also have a copy of an inventory done on the death of an Andrew Corry (father of a William) of Fauld in March 1733, so just maybe that is when Andrew Graham took over? And a recent addition to the story is the will of one John Corry written at Fauld in 1799 referring to his mother Jane and 5 sisters, as well as to money lent to the above Grimston Graham and with a David Graham as a witness to his will. I don't know how to interpret the fact that he was the tenant when I believed David and/or Grimston Graham were around this time, maybe there's more than one tenancy on the place? Jun 1827: Death of Sibble (at Longtown), wife of Mr William Corrie, late of Fauld. Jun 1829: Mr William Corry, formerly of the Fauld near Longtown, died. 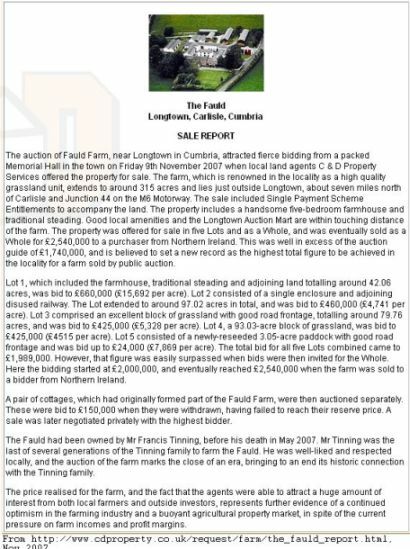 Copied below is a report of the recent (Nov 2007) sale of Fauld after the death of a Francis Tinning, a relative of one of my newfound WIGHT descendants here in NZ (small world).